White-thorn acacia | Infonet Biovision Home. 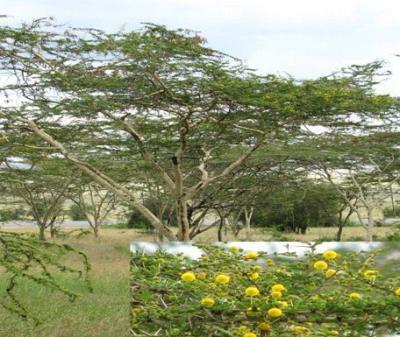 A typical savanna acacia, it is native to Egypt, Eritrea, Ethiopia, Ghana, Iran, Israel, Kenya, Malawi, Mali, Mozambique, Namibia, Niger, Nigeria, Saudi Arabia, Senegal, Sudan, Syrian Arab Republic, Tanzania, Uganda, Yemen, Republic of, Zambia and Zimbabwe. It is widespread in semi-arid areas of Africa from Senegal to Egypt south to Malawi and Zimbabwe. In Kenya, it is found in the open or bushed grasslands and woodlands, especially at the foot of hills and on plains, often as the dominant tree. The tree produces a clear edible gum sold to generate income, although of less value than that of A. Senegal. A local wood preservative (asal) is derived by boiling the bark in wate. 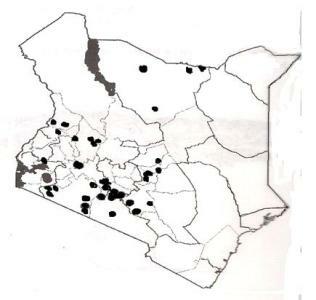 Among the Luos, it is believed that planting it in homesteads causes the elder wife either to die or remain childless. It flourishes in the altitude ranges of 1700 and 2000 m above sea level, mean annual temperatures of between 18 and 280 C, and mean annual rainfall of 250 and 1000 mm, Soil type: It normally prefers heavy, clayey soils, stony gravely alluvial soils or humic soils. Food: it produces edible gum which is eaten when fresh, although it has slightly acid taste. It can also be mixed with pulp from the fruit of Balanites aegyptiaca to make syrup. Fodder: The bark is extensively used for feeding cattle, sheep and goats during the dry season. When fresh, it is smooth and relatively soft. Apiculture: It has a yellow fragrant in the flowers which yields white-coloured honey with mild aroma. Fuel: A. seyal produces good, dense firewood that is used widely throughout the areas where it is found. Its smoke is pleasantly fragrant and the wood burns quickly. Fibre: The bark of A. seyal can be used for making ropes. This fibre has promising technological characteristics for use as particleboard. Timber: A. seyal wood has potential in rural areas as timber, if the tree is grown with few knots and straight grain, sprayed with insecticide after felling, and treated with preservatives, the timber works well and is hard and tough. Gum or resin: The gum from A. seyal is of inferior quality to that of A. senegal (gum arabic). However, it forms ten percent of the Sudanese gum exported to India and Europe. The gum is edible when fresh, with a slightly acidic taste. Tannin or dyestuff: tannin is extracted from the pods and bark. Gum can then mixed with soot and powdered Nubian sandstone for making black and red ink. Poison: Smoke produced by burning the wood of A. seyal can act as a fumigant against insects and lice. Medicine: Extracts from the bark, leaves and gums are used for colds, diarrhoea, hemorrhage, jaundice, headache and burns. A bark decoction is used against leprosy and dysentery, is a stimulant and acts as a purgative for humans and animals. Exposure to smoke can relieve rheumatic pains and a root decoction mixed with leaves of Combretum glutinosum and curdled milk causes strong diuresis. Shade or shelter: Where it grows, A. seyal offers shade to livestock when it is hot. Boundary or barrier or support: In many areas, farmers cut branches of A. seyal to make fences, thorny branches are good for this purpose and last about 2 years. Soil improvement: they help in nutrient cycling when the leaves fall. Windbreak: they reduce the speed of the wind which could otherwise be destructive. Above forty species of insects are reportedly associated with A. seyal though bostrychid, Sinoxylon senegalense is the most notorious in swiftly locating and infesting freshly cut woods especially if lying on the ground. Infestation can be minimized by removal of the bark and stacking cut stems upright. Treatment of the woods by creosote to prolongs its durability. Maundu P. and Bo Tengnas. (2005)Useful trees and shrubs for Kenya, World Agroforestry Centre.